So, have you ever wanted a one-stop solution for all your smartphone needs? From Data, recovery to easily transfer files between co android devices and backing up on PC, all wirelessly. This app does it all! 0.1 So, which app is it? 0.2.1 What else does this app do? 0.3.1 Why is this feature important? 0.4 Do you even Backup? So, which app is it? It is the app, which we found after trying out a bunch of other applications on Play store. It is called Dr.Fone. We believe that Dr.Fone is the one-stop solution for taking basic care of your smartphone. There must have been some instances in your life, where you’ve accidentally deleted an important photo of a person, and you want it back? Or maybe it’s your Ex’s contact details or call-logs or maybe messages. You thought you could never get back the lost data. Until you saw this post. If you’ve ever done that or just want to recover lost data like contacts, pictures, videos.Etc. then Dr.Fone is the app you need. Dr.Fone will instantly recover all the stuff which you’ve deleted and will present them in front of you. And, we’ve also tested with Whatsapp and Bam! It did recover our WhatsApp messages and documents. Nope! You can even use it on a non-rooted device. It works equally well. But, rooting will unlock more functionalities present in the app. So, recover your files, let us know in the comments below if it worked. Apart from useful features like recovering lost data, there’s one more feature that Dr.Fone is known for. It is the File Transfer feature. 1. 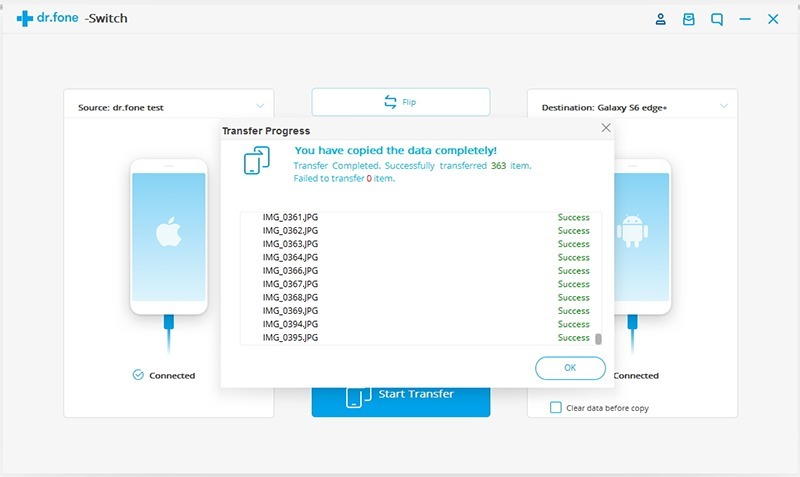 Transferring files wirelessly between Android and computer. 2. Transfer iTunes to Android (vice versa). 3. 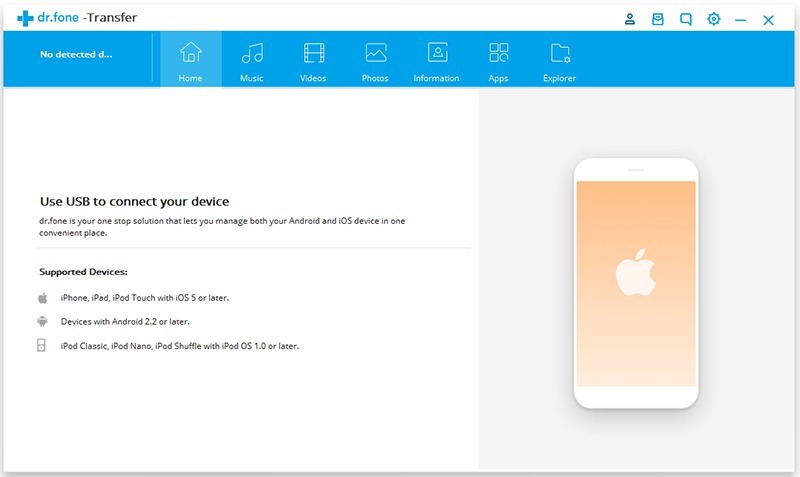 Manage your Android device on the computer. 4. Transferring files from one Android phone to another Android phone. It is vital because everything happens quick. Gone are the days when we had lengthy tangled cables which transferred files to your computer at the speed of a snail. With Dr.Fone your phone is a mini rocket and files fly from your device to PC in just fraction of a second. Your phone is a part of your body. But, what if someone out there steals your phone? Or you forget it somewhere. You don’t even have a backup. Which means you’ve to again start from scratch. 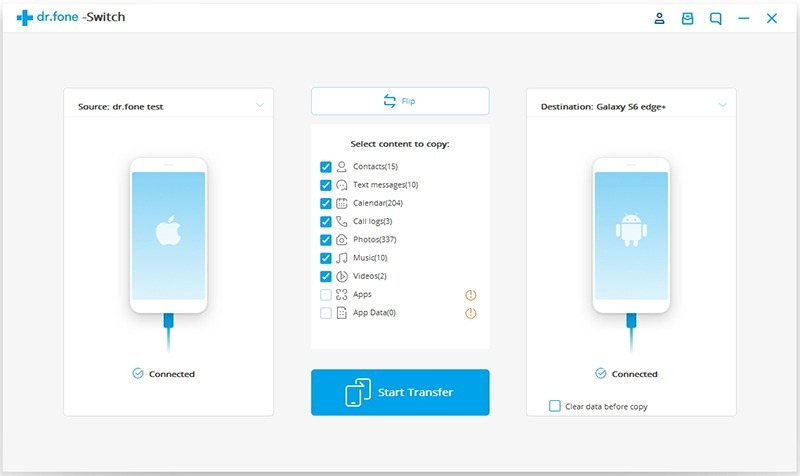 If you’re upgrading your phone, you can now transfer data from your old android phone to your new Android phone in just a click. 2. Open it and click on “Switch” to transfer data between two phones. 4. Check on everything you want to transfer, like files, messages, WhatsApp chats.etc and Click on start! Voila! You’ve now transferred all the data from your old phone to your new device. Sometimes the contacts and other passwords are stored in your Google Account. So, go to Settings > Accounts> Google and click on sync everything. Now that’s how you efficiently transfer data between two devices. Transferring data from your phone to PC isn’t a tough task at all. 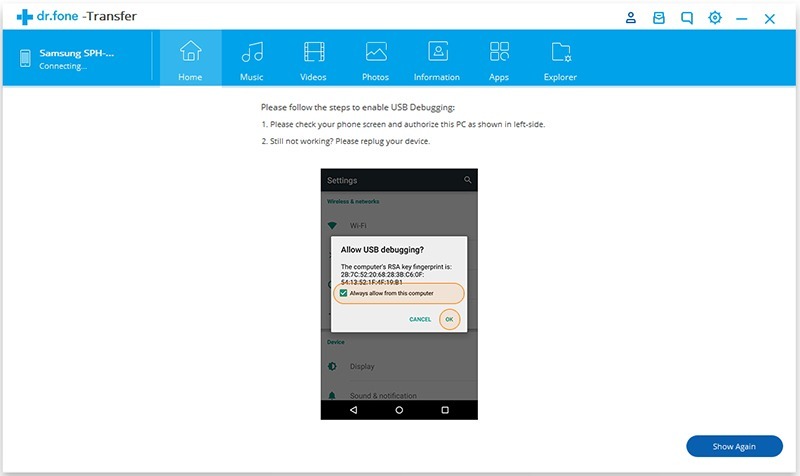 But before that, you got to learn little tweaks, like enabling USB debugging on your Android device. -> Connect your android device to the computer via USB port. -> The steps will automatically be shown on the screen on how to enable USB debugging. Normally, it’s quite same for most of the devices. We can do it by going to Settings>About device > Software info > Build number (tap 7 times) > Developer Options > USB Debugging. What If your device fails to connect? 4. Install the driver for your Android device. After enabling USB debugging, you’ve now successfully connected your android device to your PC. Now, every time you connect your phone will automatically be recognized by the software. That’s how simple this process is. Dr.Fone eliminates all the hassles of data transfer and backup, which was once a tedious process. We recommend this software to everyone who wants to backup and transfer data on the go.